Local TV stations that share news operations or content do so in a number of different ways, which have varying impacts on the news programming available to consumers. The most common type of news sharing arrangement involves one newsroom producing newscasts for more than one outlet in the same market. In most cases, both stations are either owned or operated by the same company. Co-owned stations are known in the broadcast industry as duopolies. In Boston, for example, Sunbeam Television owns the NBC affiliate, WHDH. It was allowed to buy what was then the WB affiliate, WLVI, from Tribune in 2006 because that station was not among the top four rated television outlets in the market. Other sales have been approved by the FCC under what is known as a “failing station waiver,” which allows a sale to go through on the ground that it is the only way to keep the station being acquired on the air. Jointly operated stations are known as virtual duopolies. Sinclair, for example, has an operating agreement with Cunningham Broadcasting, which is controlled by the family trusts of Sinclair’s owner, David Smith. Cunningham owns six stations, all of which are run by Sinclair.41 Cunningham stations that run local news get it from a Sinclair station. Nexstar has a similar arrangement with Mission Broadcasting, which owns 20 stations, all of them in markets where Nexstar also owns a station. Nexstar holds a controlling interest in Mission, according to its SEC filings, and operates all of Mission’s stations.42 None of Mission’s news operations are independent from Nexstar. 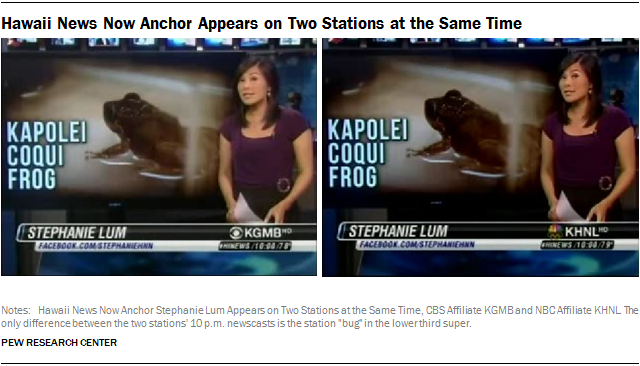 A second, more common type of news sharing involves one newsroom producing newscasts for two stations that air at different times, but with identical anchor teams and almost all of the same content. 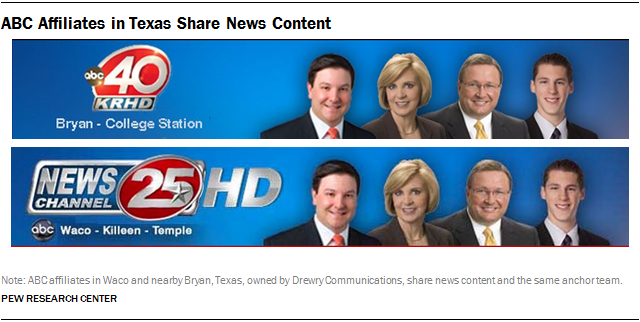 Some small-market stations like KRHD in Bryan, Texas, and WDFX in Dothan, Ala., employ only a few journalists. They cover stories that are inserted into newscasts produced by co-owned stations in nearby cities. In most cases, these newscasts that use the same anchor team on different stations in the same market are branded separately, but not always. In Chico, Calif., for example, ABC affiliate KRCR, owned by Bonten, produces a 10 p.m. newscast for the Esteem-owned Fox affiliate, but brands it “KRCR News Channel 7 on FOX 20.” In Grand Rapids, Mich., the NBC affiliate WOOD produces news for the co-owned MyNetworkTV station but promotes it as a WOOD News 8 product. A third type of news sharing arrangement involves consolidated newsrooms producing newscasts with separate news anchor teams but using many of the same reporters and stories. 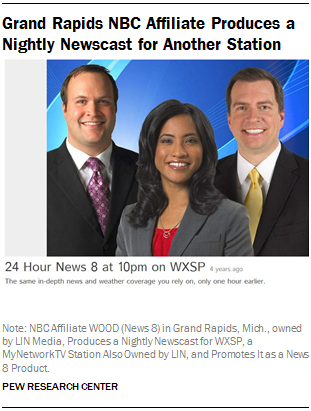 In Syracuse, N.Y., for example, the 11 p.m. newscast on CBS affiliate WTVH, owned by Granite, is produced by Sinclair’s NBC affiliate WSTM, which airs its own late news at the same time. The programs have different news anchors, but share weather and sports anchors, whose segments have to be scheduled down to the minute to give them time to change locations. In West Palm Beach, Fla, the Scripps-owned NBC affiliate, WPTV, produces morning, afternoon and late news for Raycom’s Fox affiliate, WFLX. NBC and Telemundo, both owned by Comcast, share newsrooms in seven U.S. markets and produce separate news programs in two different languages (English and Spanish). “Our NBC newsrooms are so much larger than the Telemundo newsrooms that if you combine them, it gives Telemundo so many more resources to do a better job for the Spanish-language viewer that I think is underserved and needs more information,” said Valari Staab, president of NBCUniversal television stations. Sharing agreements can involve combined websites, often featuring logos of both stations, even when they are separately owned. 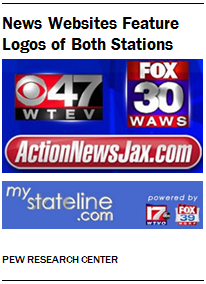 MyStateline.com, for example, is the joint website of Nexstar-owned WQRF and Mission’s WTVO in Rockford, Ill. ActionNewsJax.com is the joint website of Cox-owned WAWS and WTEV, owned by Bayshore Television, in Jacksonville, Fla.